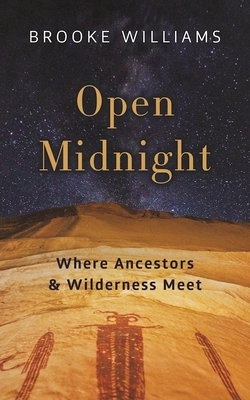 Open Midnight weaves two parallel stories about the great wilderness--Brooke Williams's year alone with his dog ground truthing wilderness maps of southern Utah, and that of his great-great-great-grandfather, who in 1863 made his way with a group of Mormons from England across the wilderness almost to Utah, dying a week short. The book is also about two levels of history--personal, as represented by William Williams, and collective, as represented by Charles Darwin, who lived in Shrewsbury, England, at about the same time as Williams. As Brooke Williams begins researching the story of his oldest known ancestor, he realizes that he has few facts. He wonders if a handful of dates can tell the story of a life, writing, "If those points were stars in the sky, we would connect them to make a constellation, which is what I've made with his life by creating the parts missing from his story." Thus William Williams becomes a kind of spiritual guide, a shamanlike consciousness that accompanies the author on his wilderness and life journeys, and that appears at pivotal points when the author is required to choose a certain course. The mysterious presence of his ancestor inspires the author to create imagined scenes in which Williams meets Darwin in Shrewsbury, sowing something central in the DNA that eventually passes to Brooke Williams, whose life has been devoted to nature and wilderness. Brooke Williams's inventive and vivid prose pushes boundaries and investigates new ways toward knowledge and experience, inviting readers to think unconventionally about how we experience reality, spirituality, and the wild. The author draws on Jungian psychology to relate how our consciousness of the wild is culturally embedded in our psyche, and how a deep connection to the wild can promote emotional and psychological well-being. Williams's narrative goes beyond a call for conservation, but in the vein of writers like Joanna Macy, Bill Plotkin, David Abram, the author argues passionately for the importance of wildness is to the human soul. Reading Williams's inspired prose provides a measure of hope for protecting the beautiful places that we all need to thrive. Open Midnight is grounded in the present by Williams's descriptions of the Utah lands he explores. He beautifully evokes the feeling of being solitary in the wild, at home in the deepest sense, in the presence of the sublime. In doing so, he conveys what Gary Snyder calls "a practice of the wild" more completely than any other work. Williams also relates an insider's view of negotiations about wilderness protection. As an advocate working for the Southern Utah Wilderness Alliance, he represents a minority in meetings designed to open wilderness lands to roads and hunting. He portrays the mindset of the majority of Utah's citizens, who argue passionately for their rights to use their lands however they wish. The phrase "open midnight," as Williams sees it, evokes the time between dusk and dawn, between where we've been and where we're going, and the unconscious where all possibilities are hidden. Brooke Williams has spent the last thirty years advocating for wilderness. He is the author of four books, including Halflives: Reconciling Work and Wildness. His journalistic pieces have appeared in Outside, the Huffington Post, Orion, and Saltfront. He and his wife, Terry Tempest Williams, divide their time between Utah and Wyoming.